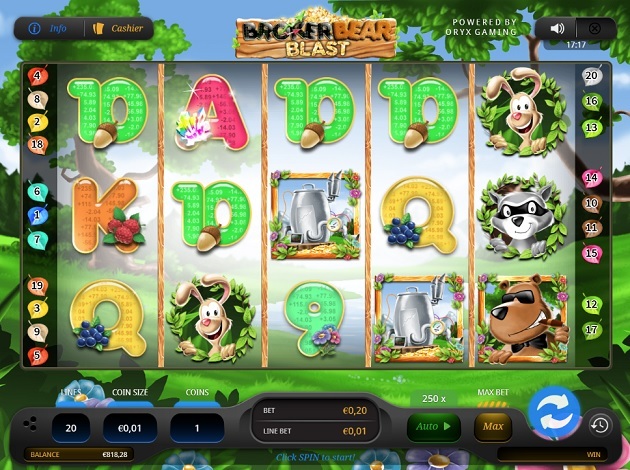 If you’re a country-side, forest and animal lover, then Broker Bear Blast which is powered by Oryx Gaming is going to be an enjoyable slot for you to play. The RTP is 95.01% and there are 20 paylines in Broker Bear Blast however, you can choose to play with less lines if that is your preference. Aside from that, you can expect to see the general set up of five reels and three rows in this cute, forest animal themed slot. The minimum bet in Broker Bear Blast is € 0.2 while the maximum bet is € 100. The wild symbol in Broker Bear is Broker Bear himself! Broker Bear is wearing a bow tie, sunglasses and has a cigar in his mouth looking quite cool. Broker Bear wild appears on reels one, three and five. Broker Bear Wild substitutes for all symbols except the scatter symbol. The scatter symbol is the Investment Machine which looks like a metal container. Landing the scatter symbol three or more times will trigger the Investment Machine Bonus Feature. Besides the wild symbol and scatter symbol there is a Randy Raccoon symbol, Foxy the fox symbol, Bun Buns Bunny symbol and the playing card symbols. The animal symbols are extremely adorable, all with different expressions on their faces. The playing card symbols are bubbly and colourful representing the different tints of the forest. They also have different fruits and other gatherings from the forest like nuts, mushrooms and flowers at the bottom of each playing card symbol. Broker Bears rarely appears even in pairs, but when you catch them in a group of three anywhere on reels one, three and five, you’ll be gifted by the forest with 15 free spins with a x3 multiplier. An additional 15 free spins can be won within the free spins indefinitely, however the multiplier remains at three. When you land three, four or five scatter symbols, you gain the exclusive right to use the magical Investment Machine. Once you’ve entered this bonus feature, you’ll be asked to pick three goods from the forest that will go into the machine where their current value will be determined. Then, with the help from your furry friends and some luck, the Investment Machine will process the goods thoroughly to produce gold (your winnings) which will come out on the other end. At the end you are congratulated with a screen that shows your winnings! The process of this round is simple, but fun as the earnings are quite nice. The highest paying symbol is Randy Raccoon who can reward you with 200x your stake! Foxy the fox is the next highest paying symbol who rewards you with up to 50x your stake. Bun Buns Bunny can reward you with up to 30x your stake. Letters A and K are the highest-lowest paying symbols that can offer up to 10x your total bet. Letters Q and J can reward you with 7.5x your stake while the lowest paying symbols are the 10 and 9 which can reward you with 5x your stake. In the background is a lovely open green field with a few tall, green trees. There are also a few colourful flowers at the bottom of the play screen close to where all the buttons are for the bet, spin and so on. The symbols are bright and vibrant grabbing your attention. There isn’t a soundtrack playing constantly, instead there are birds chirping and various insects making sounds in the background when the reels are at a standstill. However, when you land on a win, there are different music sounds made as well as animal noises depending on which animal is in the winning line. You can find the paytable by clicking on the ‘info’ button on the top left corner and the autoplay button is on the bottom right next to where the bet information is. Broker Bear Blast slot has a simple setup and gameplay, however it’s still a fun and light game to play. The animations are enchanting and other aspects make the game livelier like when the animals make sounds. Not only are the graphics wonderful, but this slot is packed full of charming features that players are guaranteed to love! Take a walk through the forest and play Broker Bear today at Videoslots! Check out ORYX Gaming’s Quick Slinger Bam Bam and Anaconda Eye Rapids here at Videoslots!